I made these soft, fluffy and tasty rava idlis for breakfast yesterday. 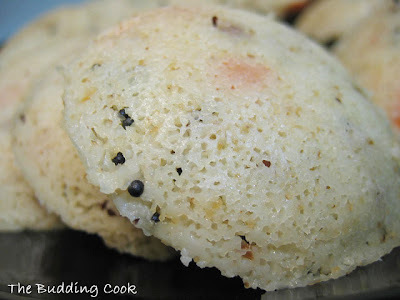 I came across the recipe for instant idlis on Anita's blog a relatively long time back. I am one of those South Indians who prefers dosas over idlis any day, but the recipe looked too good not to try. I love the fact that there is no soaking or grinding involved here. For the original recipe, head over to Anita's A Mad Tea Party. I had to make a couple of changes to the original recipe since I had to work with what I had. I really wish I had had curry leaves, green chillies and coriander though. You can add whatever vegetables you want to the batter. I only had a couple of baby carrots and some scallions. Heat oil in a big pan. Add the ingredients for the seasoning followed by the carrots and scallions. Cook for a minute or two. Add the rava to the same pan and roast it for a few minutes till it smells done. Cool. Transfer to big bowl. Add yogurt, buttermilk, salt and baking soda and mix well. Add enough water to make a batter that is sufficiently thick yet pourable. Pour the batter in greased idli trays and steam for 12-15 minutes in a pressure cooker (without the weight). 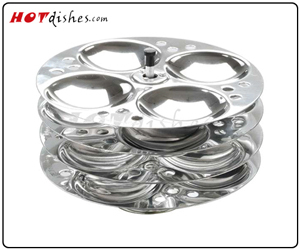 Allow the idlis to rest for a few minutes in the tray itself (very important to avoid a sticky mess) before plating them. Serve hot with accompaniment of your choice. We had ours with coconut chutney. These look so soft & fluffy... yes.. the coconut, coriander and curry leaves will kick it up a notch. We love this at home. That looks so fluffy and nice! gr8 recipe! first time to ur blog! join in the savory event going in my blog! idlis look fabulous. So soft and yummy! Wow awesome idlis. Looks fluffy and yum. hey ilove rava idlis, its been awhile since i md these. looks good. the idlis look so good. in my house they call me a great idly fan. but I make the soft urad/rice idlis only. never made these. they look so inviting!! Heya , wish you very Happy Holidays n seasons Greetings . Rawa idlis are what I make when idlis are in demand and I'm out of batter. And we love them. Best wishes for the festive season and a Happy New Year. Hi, how are you? Happy new year! Same as you, I love dosas over idlis. But there is something about rava idlis for breakfast, that makes a day. Hi, Happy New Year to you! I usually make rava idlies using MTR instant mix,thanx for this recipe! Mm..love rava idlis! Yours look amazing. I make mine in the microwave. hey..thanks for this recipe. I found this yesterday and tried it today morning. They were delicious. I used carrots and pieces of fresh coconut. I did not add red chilli flakes or buttermilk or onions. It was heavenly. i am going to make rava idlis now! seasons greetings to ALL.yes,just now i have prepared batter for idlis and left for soaking overnight!will report outcome in the morning! Suryahatti- Season's Greetings to you as well. 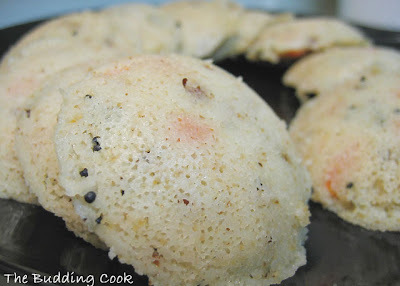 I hope you're making regular idlis and not the rava idlis that this post is about. Rava idlis are instant idlis and do not require any kind of soaking-fermenting!